Bloomingdale sophomore wins area's lone state wrestling title. When David Mason lost at the 6A-North Region II semifinals at East Lake High School two weeks ago, he stormed off the mat. Last Saturday, he stormed into the state championship. Mason, a Bloomingdale 103-pounder, brought home the Brandon area's only individual 6A state wrestling title with a 10-3 decision against Miami Sunset's Alfredo Cheang in the FHSAA State Championship bout at The Lakeland Center Saturday. "My loss at regional reminded me how hard I had to work at state," Mason said. 'I wanted to win for myself and also to help our program get better. I'm going to wrestle in the off-season, go to Cadet Nationals go to Glenn Good- man's Florida Pride Camp. 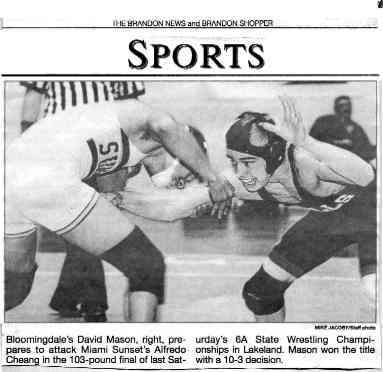 � Mason became Bloomindale's first underclassman and second wrestler ever to win a state individual title, �the first being Kevin Williams in 1990. Bloomingdale head coach Scot Tipton was pleased with Mason's achievement, as well as � 119-pounder Toby Tuberosa's sixth-place finish. 'The final match was the only match Mason dominated" Tipton said. 'Two came in overtime, with one going to criteria.